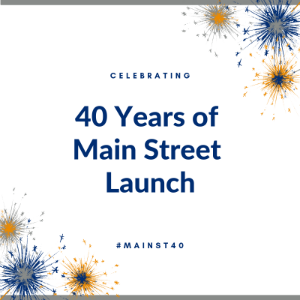 Main Street Launch is thrilled to celebrate 40 years of supporting small business owners. In our newsletters, we will share with you our reflections on where we’ve been, where we are now, and where we’re going next. Throughout our history, Main Street Launch has been guided by our five core values: Opportunity, Diversity, Empowerment, Innovation, and Partnership. You’ll see these values reflected throughout the campaign. Social media campaigns, and more! Follow our anniversary campaign by visiting our website and follow #MainSt40 on social media (Twitter, Facebook, Instagram, and Linkedin). Main Street was originally launched in collaboration with the City of Oakland Economic Development Agency, and started as a member nonprofit with eight people in 1979. Learn more facts about Main Street Launch by following #MainSt40. We are thrilled to partner again with Bywater Films to produce new videos showcasing Main Street Launch and our clients. Check out our kick-off video below, and stay tuned for more video releases later this year. Blue Heron Catering recently celebrated their 30th anniversary in 2018. Congratulations! Debbie Pfisterer’s inspiration for starting a catering company came to her while attending college at CSU East Bay for Business Administration where she had classes with presentations about small businesses. Debbie came from a family that loved to cook, and she carried that trait forward by cooking and baking for her loved ones in her free time. After being inspired by her first job at a bakery, then a food broker, her family, and her passion for sharing delicious food, Debbie set off on her journey to start her own catering company. Main Street Launch (then OBDC) funded Blue Heron Catering in 2007, and then again in 2018. 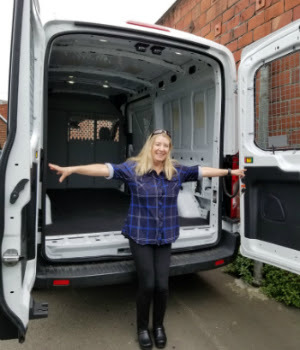 Debbie’s most recent loan expanded her fleet of vans, enabling Blue Heron to take on more business. Click here to learn more about Blue Heron Catering. Our partners, funders, and collaborators make our work possible and more impactful. We’re grateful to our community of supporters and look forward to profiling some of our partners throughout the year. Visit our blog for more partner profiles. The Small Business Administration has been a critically important partner in our work in funding and supporting small business owners. Main Street Launch became a SBA Microlender in 1999, funding our expansion beyond Oakland into the broader Bay Area, which launched the beginning of our work in San Francisco. The SBA has collaborated with us on many activities, perhaps most importantly in our lending work. Main Street Launch is proud to be one the largest SBA Community Advantage lenders in the country, supporting small businesses with loans up to $250,000 to start or grow their businesses. The SBA Micro program has enabled our work in offering advising services and other resources to business owners once funded, helping their businesses grow and thrive. We’re grateful the SBA features Main Street Launch at panels, collaborates with us on events, and provides loan products that enable our work. The SBA features local small businesses, provides workshops and other resources to help you achieve your business goals, and does great work in supporting our local nonprofit community. Click here to learn more about the SBA’s work in the country and click here to learn more about their work in our local district office. Thank you so much to the SBA for your long-term partnership and support. Main Street Launch is grateful to Citi Foundation for their support of our work. We’re proud to be a recipient of their Community Progress Makers Fund, joining a cohort of incredible organizations around the country doing great work in serving local communities. In celebration, we joined the “What Progress Looks Like” campaign from January 28 to February 4. Check out all the great content by following #ProgressMakers. We shared stories of our work and of the impact of the Community Progress Makers award.